demz is da most cutest kittehnz in da world!!! 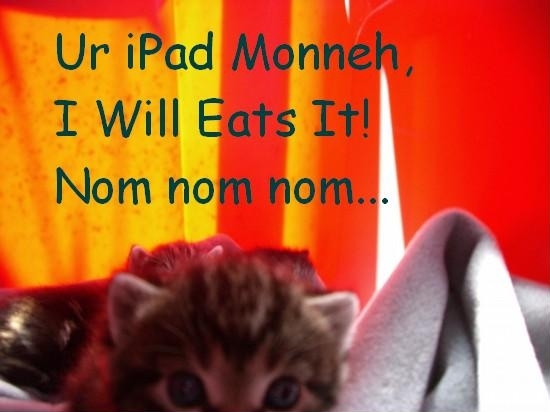 maybe you can make a cute kitteh poster and sell millions of copies and get money from that to buy an ipad!!!!! They are so adorable. :) I would happily keep them in sardines. Adorable little devilish things!! So much better than an iPad. The force is strong with these kitties. They’re hanging in. You’re doing a job. 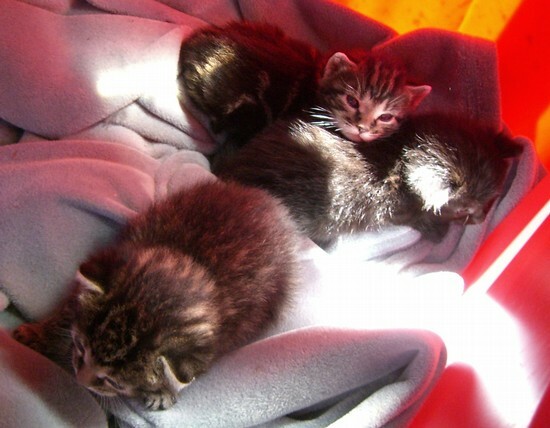 About 15 years ago, my brother-in-law found 7 orphan kitties, about 2 days old (they still had their umbilical cords). We took three of them and bottle fed them (and everything else) while he cared for the other 4. The one we kept was my sweet Llumi. She had an awesome life but died last year. Still miss her. You rock. Love those kittens – and I agree, who needs an iPad when you’ve got them. In fact, I’m such a cat lover that I often think it would be good if we homo sapiens were descended from cats and not apes! If we were, though, I doubt we’d have as much social interaction. Facebook would not exists, nor Twitter. THEY ARE SO CUTE OMG. MOAR KITTEHZ. Isn’t it sad that my first two comments on your blog are about Teh Awsum Powerz of Teh Kittehz? I’ve been playing catch up on your recent posts. Thanks for letting us know about the gotcha clauses in so-called e-publishers like Scribd.